We love the Land Rover Range Rover Sport's turbodiesel. Unless you absolutely must win a drag race, this refined engine is probably the way to go. Blending sport and utility like almost no other SUV, the 2017 Land Rover Range Rover Sport is impressive in any configuration. The terms "Sport" and "Range Rover" may not seem like they go together, but this popular entry into Land Rover's lineup somehow combines both impeccable road manners and a high degree of capability. New back in 2006, and completely reinvented with an aluminum body for the 2014 model year, the shorter, sportier Land Rover Ranger Rover Sport now shares much of its architecture and some of its drivetrains with its bigger sibling, the Range Rover. Last year, two new engines arrived, but the changes are less notable for 2017. The current Range Rover Sport is much lighter and more nimble than the first-generation model, which looked boxier and more like a classic Range Rover. It took unsexy materials science to make the Sport more svelte. Like the Range Rover, the Sport's body is made from glued-and-riveted aluminum, a switch from steel that's said to save up to 800 pounds. More than ever, the Sport looks like a companion to the Range Rover—but it also wears some details influenced by the smaller, more slinky Evoque. The slim nose, winged headlamps, the dramatic roofline drop are all inspired by the Evoque. Inside, the cabin remains pure Range Rover, architectural and calm, with the emphasis places on wide swaths of leather and aluminum, pared down to a minimum of surfaces, switchgear, and seams. No shortage of personalization options are on offer. Weighing in at around 5,000 pounds, with a taut suspension tune, the Range Rover Sport is convincingly sporty. 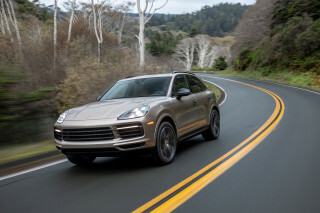 Five different powertrain choices, covering every part of the SUV landscape from turbodiesel economy to supercar-like V-8 thrust, are on offer. Anchoring the bottom end of the lineup is a 340-horsepower, 3.0-liter supercharged V-6 base engine, delivering a nice 90-degree V-6 snarl and sub-7-second acceleration to 60 mph, in tandem with a delightful paddle-shifted 8-speed automatic. From there, a supercharged V-8 comes in two power outputs: In standard form, it barks out 510 hp with NASCAR authority, ripping off five-second runs to 60 mph. An SVR version puts out an immense 550 hp and 502 lb-ft of torque that gets fed to upgraded mechanicals. Last year's limited edition HST, a fusion of the SVR's sporty suspension and the base engine's lower price point, is no longer. The Range Rover Sport also offers a turbodiesel V-6. With 254 hp and 440 lb-ft of torque, it delivers 0-60 mph times equal to the base supercharged V-6, an extremely quiet driving experience, and EPA fuel economy of 22 mpg city, 29 highway, 25 combined. 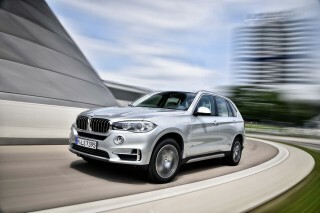 For the frugal, long-term-thinking Sport driver, it's the obvious choice. Across the lineup, the Sport's ride/handling worldview tilts firmly to, as you might expect, sport. The bigger Range Rover specializes in coddling while the Sport's similar air dampers and variable-ratio steering are tuned quicken up the pace. The V-8's Dynamic setting dials out much of the innate lean and scrub dictated by its height and weight. It's much closer now to the benchmarks set by the uber-'utes from Germany. The SVR doesn't just lean toward sport—it's firmly planted there, with its upgraded chassis, firmer suspension tuning, meaty 21-inch wheels and tires, and myriad other tweaks making it a rocket of an SUV. At the same time, the Range Rover Sport is an incredibly capable muckraker, with either the Torsen four-wheel-drive setup, or the more advanced two-speed four-wheel-drive system, with its active rear locking differential that helps improve traction on pavement and off. The two-speed system is standard on V-8 models and available as an option with the V-6. With more ground clearance than ever, the Sport can extract itself from almost anything the bigger Range Rover can, and its slight size advantage might let it squeeze through where the executive-class Land Rover might not. Land Rover even designed the SVR to retain its off-road readiness, keeping the same Terrain Response 2 system and low-range-equipped transfer case, but upgrading the computers and hardware in the driveline to better handle the extra power and torque. 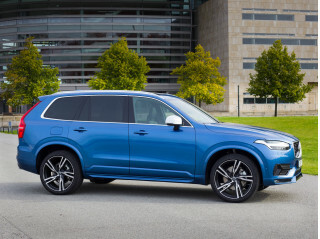 The Sport's cabin has never looked better, and the latest model's extra room in almost all dimensions solves one of the least happy aspects of the first-generation version, though the second-row seat isn't quite as supportive as the Range Rover's. These are the sacrifices. There's even seating for seven, but trust us when we say you won't want to ride in the way-back unless you're working on your ABC's. Multiple trim lines are available on the Range Rover Sport: the SE and HSE are both outfitted with the gas V-6 engine but offer the diesel V-6 as an option. The Supercharged and Autobiography add the 510-hp V-8 engine. And then there's the range-topping SVR, which gets the 550-hp version of the supercharged V-8 along with plenty of performance-influenced styling and chassis upgrades. The same is true for features and safety content. For 2017, the Range Rover Sport adds some infotainment upgrades, as well as a host of modifications to its stability control to aid backing up a trailer and off-roading. Its option packages have been slightly reconfigured, which reduces the number of choices on offer but should simplify the shopping process. Automatic emergency braking, a crucial safety item, is standard on all Sports for 2017. Inside, the new 10.2-inch touchscreen infotainment screen now utilizes tablet-esque pinch and scroll functionality but remains a little more convoluted than in some rivals. The Range Rover Sport is like a cloned, 9/10ths version of its big brother. Though it is almost indistinguishable from its larger Range Rover sibling, the Sport is nonetheless attractive. Especially clean lines and a wide, aggressive stance give it a definite sense of purpose—one of both its mountain climbing potential and its sporty driving demeanor on a curvy paved road. A floated roof, chunky but unobtrusive grille, blacked-out pillars, and a sleek, smooth surface all around give the Range Rover Sport is family resemblance. The roof’s dynamic slope, a stubby nose, and tall sides speak of the “Sport” appellation in addition to the Land Rover and Range Rover heritage. Fender and hood vents give the Sport a further edge. 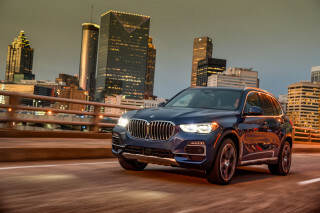 The SUV's tail, likewise, is short and chopped, with swollen wheel arches, smoothly faired headlights, and an overall sense of sleekness. Though even the standard Range Rover Sport is aggressive, the SVR breaks away with an even meaner stance with bigger wheels and wider tires. Inside, the Range Rover Sport shows its relation to the larger Range Rover SUV more clearly, with only the essentials of dials and switches remaining, with the rest of the vehicle’s command and control functionality offloaded to the infotainment system’s touchscreen. That screen is a new, 10.2-inch unit with updated software for 2017 that generally performs and looks better than before but still throws up a lot of information on the monitor for the driver to process at a quick glance. Wood and leather dominate the cabin, wrapping just about every exposed surface—and those materials are even swankier the further up the food chain you go. Every model gets four bucket-style seats (and an occasional-use second-row center seat), but SVR models get heavily bolstered front seats and outboard rear seats, with SVR badges denoting the vehicle’s higher performance. The Range Rover Sport's cargo area is similarly beautifully finished, but opting for the 5+2 seating package nets a pair of stowable seats best left for children. Truthfully, the Range Rover Sport does nothing poorly. It excels on and off road. Three core powertrains, all of them with standard four-wheel drive, a low-range transfer case, and an 8-speed automatic transmission, mean serious business in the 2017 Land Rover Range Rover Sport. The entry point remains a 3.0-liter supercharged V-6 shared with Jaguar. Good for 340 horsepower and 332 pound-feet of torque, the V-6 is quick and it sounds good, hitting 60 mph in about seven seconds before topping out at 130 mph. 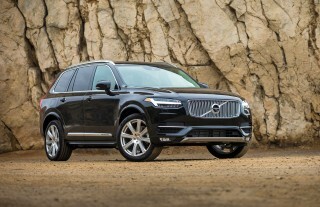 Next up is a 3.0-liter V-6 turbodiesel engine rated at 254 hp and, more importantly, 440 lb-ft of torque. Its 0-60 mph times are just a tick behind the gas V-6, and substantial sound deadening means it is essentially inaudible. Despite the narrow powerband inherent to diesels (peak torque arrives at 1,750 rpm), it doesn't diminish the Sport's performance envelope in any notable way. If anything, the 658 highway miles of driving on a single tank of fuel expands its appeal, albeit in a novel way. Topping the range is a 5.0-liter supercharged V-8, available in two flavors. Rated for 510 hp and 461 lb-ft of torque in the Supercharged and 550 hp and 502 lb-ft in the SVR, it makes either variant into an insanely quick SUV. The SVR will bolt to 60 mph from a stop in just 4.5 seconds and it merges onto freeways like a serious sports car; one that devours long stretches like an autobahn cruiser; one that doesn’t cringe at a nice stretch of curves. 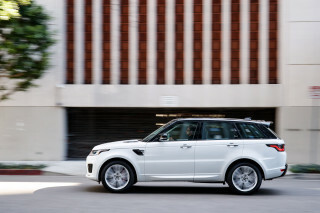 In any form, the Range Rover Sport is impressive on the road, handling and accelerating like a sport sedan. In SVR trim, this big SUV is even capable of track duty. That's right: You could take a Range Rover to your local race track and have a ball. All models are polished, but the SVR definitely turns things up. Despite the crisp and capable performance driving characteristics, the Range Rover Sport remains comfortable on the road—as you’d expect—but also extremely capable off-road. Among the Range Rover Sport's capabilities is an impressive ability to scrabble over roots and rocks, through sand, gravel, and mud, and to ford creeks up to 33.5 inches deep. It has wheel travel of 10.2 inches front and 10.7 inches rear, plus 9.3 inches of ground clearance for off-roading—and, of course, the brand's vaunted Terrain Response 2 system for drivetrain, stability and traction control, and other systems. The Terrain Response selector offers modes for nearly any terrain, and the system manages its rear and center differentials, plus uses the brakes and traction control systems, to completely sort out any traction issues with total transparency to the driver. Terrain Response 2 includes seven modes: General, Dynamic, Grass/Gravel/Snow, Mud/Ruts, Sand, Rock Crawl, and Auto. Auto mode automatically selects the best mode based on the input from the vehicle sensors. 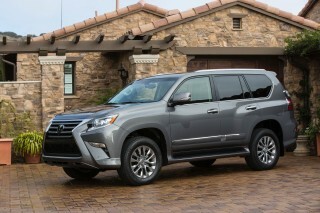 It’s one of the best vehicles available off-road, and it’s also one of the easiest to drive when the going gets rough. For 2017, the Range Rover Sport is a better towing vehicle than before thanks to a new towing assistance software update that uses the rearview camera to help direct drivers with the difficult task of backing up a trailer. All Sports except the SVR are rated to tow 7,716 pounds; the sporty model drops that figure to 6,614 lbs. Prime materials and a roomy second row make this a great place to spend time. Just stay out of the cramped third row. The Range Rover Sport’s role in the Land Rover family is becoming familiar and function: in the latest generation, it’s longer and more space-efficient, nearly matching the previous-generation full-size Range Rover for its stretch-out space. In fact, our only real complaint is that with the vehicle's decidedly cramped "+2" third row. Even Land Rover doesn't consider it to be habitable space for adults. Lower (by 2.2 inches) and lighter (by about 100 pounds) than the big Range Rover, the Sport is more focused in its mission to provide excellent road manners. Its center console is taller, the front-row passengers sit in more of a cockpit than a cabin, but there’s nearly identical front-seat space in the svelter Sport as in its full-size brother. In the second row, the bench seat is clearly intended for two passengers, with outboard positions given bucket-seat-like sculpting of the bolsters.The second row splits and folds for better cargo flexibility, but access to those fold-up rearmost seats is challenging. SVR models deliver even firmer and larger seating bolsters for both the front and middle rows. True to Range Rover form, the front thrones are highly adjustable in nearly every dimension. Heating and ventilation in the front seats is available, as is a multi-mode massage function. As for quality, look, and feel, Range Rover continues to knock all measures out of the park, with a sense of solidity, refinement, and luxury in the leathers, metals, woods, and plastics used throughout the cabin. The Range Rover Sport hasn't been crash tested by the NHTSA or the IIHS. The 2017 Land Rover Range Rover Sport has not yet been crash tested by the NHTSA or the IIHS—but that's the norm for pricier, low-volume luxury vehicles. As you might expect, the Range Rover Sport offers a wide range of safety features, and for 2017 it gains standard automatic emergency braking. High-tech safety features abound in the Range Rover Sport: a surround-view camera system, parking/proximity sensors, lane-departure warning, parking assist (for both perpendicular and parallel spots), and automatic high-beam are all included. 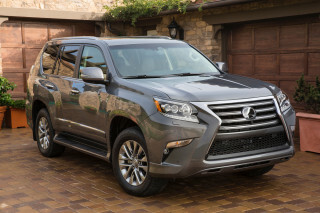 Those premium features join the expected full suite of airbags and stability control (including roll control, corner brake control, and trailer sway control) as standard equipment. The Drive Pack adds blind-spot monitors, adaptive cruise control, and traffic sign recognition that can display a road's actual speed limit in the instrument cluster. At this price, you should expect a thoroughly premium feel and lots of features. The Range Rover Sport delivers. A wide range of trim lines and equipment options makes it easy to tailor a 2017 Land Rover Range Rover Sport to your liking—although you'll pay a hefty price for added luxuries. Standard equipment is generous on the SE: Leather upholstery covers its 14-way power, heated front seats. Its audio system packs eight speakers and includes a USB input and Bluetooth connectivity. 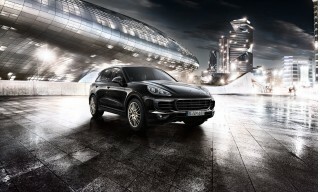 Options include a surround-view camera system and a fixed or power panoramic sunroof. Step up to the HSE and you'll gain upgraded leather trim, far more interior color options, 20-inch alloy wheels and a fixed panoramic sunroof. The Supercharged adds the 5.0-liter V-8 plus Terrain Response 2 Auto, which includes a mode that utilizes the traction control system to automatically select the best mode for whatever terrain you're about to encounter. Autobiography models are downright decadent with 19 Meridian-branded speakers, a cooled center console, and numerous styling upgrades inside. At nearly $100,000, they should pamper—and they do. The flagship Range Rover Sport SVR delivers its more powerful V-8 plus an active sports exhaust system, turned metal interior trim in place of wood, and sports seats in addition to its firmer suspension tuning. On all, an upsized 10.2-inch infotainment screen is new for 2017, supplanting last year's 8.0-inch unit. An available 12.3-inch screen in the instrument panel not only replaces conventional gauges, it offers myriad additional display capabilities including relaying navigation data. The infotainment system includes Apple and Android smartphone compatibility through the InControl app suite. The system includes the ability to interact with the car via a smartphone. For example, using a linked smartphone, the owner can see fuel level, lock or unlock the car, receive a note if the alarm sounds, start the engine, and adjust the climate control. Also featured is InControl Protect, which will automatically notify emergency services and provide GPS location of the vehicle should it be involved in a collision severe enough to trigger the airbags. Occupants can also trigger an emergency call manually by pressing a button on the overhead console. Beyond the extensive features included and available in the high-tech world, there are also a bevy of interior and exterior colors, materials, and design choices to be made when choosing your Range Rover Sport. For those with a particular taste for speed, the SVR model offers a unique exterior aerodynamics package as well as an upgraded interior with more heavily bolstered front and rear seats and SVR badging throughout the cabin. 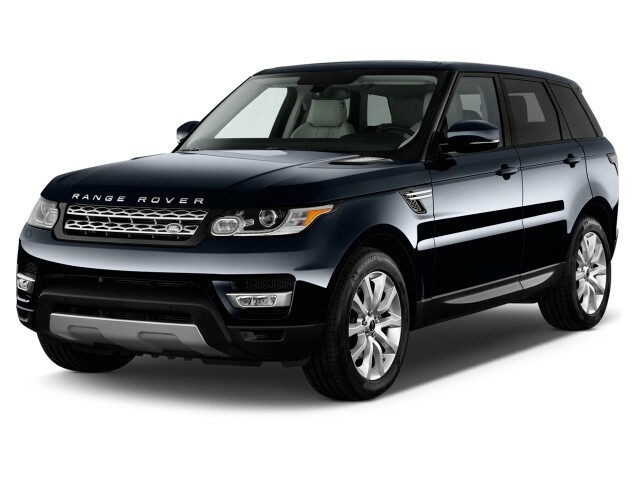 Opt for the diesel and the Range Rover Sport will turn in decent fuel economy. Years ago, the idea of an efficient Range Rover was something of an oxymoron. But the 2017 Land Rover Range Rover Sport's considerable diet and its new, thriftier engines, deliver commendable fuel economy. The turbodiesel comes in at 22 mpg city, 28 highway, 24 combined—and its big fuel tank gives it a range of more than 850 miles on the highway. EPA ratings for gas-powered Range Rover Sports are as much as 30 percent higher than in the previous version of the Sport, with the 3.0-liter supercharged V-6 model coming in at 17/23/19 mpg. Opt for the supercharged V-8 model in either standard or SVR form and you’ll get 14/19/16 mpg. Start-stop technology is included in all Range Rover Sport models, and while it doesn’t necessarily show in EPA ratings, depending on your personal driving habits and environment, it could result in noticeable gas mileage benefits. Looking for a different year of the Land Rover Range Rover Sport?